Education is obviously one of the biggest issues to affect young people today. Therefore it only makes sense that a movement which seeks the utmost betterment of the education system is one which has the best interest of the youth close to its core. So, is Marxism-Leninism such a movement? First of all, a Marxist-Leninist system guarantees each and every citizen the right to a completely free education from their first day to their last. It gets rid of the extortionate debts young people are expected to pay off today to private rackets masquerading under the façades of education facilities, instead opening the doors which were once locked behind a wall of bills and payments, excluding anyone who didn’t have the money to pay, and allowing everyone with the right skill set a chance at university education. Secondly, this genuinely universal education will be of a higher standard than the education we receive today. This ensures that all students, regardless of location or school type, may have access to the best education our nation has to offer. So how can Marxism-Leninism offer this? The lack of private schools. By there not being private institutions of education at any level, we would see, inevitably, a more equitable distribution of both facilities, as well as teachers. Without financial oligarchs holding such an overabundant share of the nation’s wealth, more money will be able to be invested in providing everyone in the country an equal distribution of the best facilities our nation has to offer. This same principle of distribution for the best results would also be the reason which leads to the best teachers not being hoarded by the rich, but having them, as their job should entail, work for the betterment of our society. Better facilities and teachers for all – not just those lucky enough to have the silver spoon shoved down their throat from the moment they’re pulled from the womb atop a red carpet. The encouragement of people to go into the field of teaching. A Marxist-Leninist system calls for an educated, trained, efficient people; with wealth redistributed to those who make it, we’ll no longer be able to rely on cheap and skilled labour from China to keep us going – everyone will need to be as educated and as skilled as possible. As such, it is the best interest of a Marxist-Leninist system to train the youth to be those educated, trained and efficient people it depends upon. It is because of this reason, we see that a Marxist-Leninist system would be forced to, even if it did not want to, encourage people into going into the field of teaching – providing better pay, better treatment of staff, a voice for them to make genuine change in the education system – whilst also providing a voice for the students to build the education system that works for them. The lack of Capitalist influence in the education system. Without corporate hegemony over the state apparatus, the rich’s stranglehold over all matters of state (education included) is broken in its entirety. Marxism-Leninism would, therefore, be free to teach its youth not what best suits the Capitalist class (the skills to exploit via “business”, history built on completely biased and unchecked assumptions, the most basic and inconclusive philosophy), but what best suits itself: the people. This freedom would facilitate proper analyses of history, economics, society and politics, as well as an education system not rife with pointless elements used to distract and bore the youth into not falling in love with education. There is no denying that a popular education system, one which is universal and which cannot be overcome with the right bribe, would be formulated in a way with the best interest of the people at heart. Finally, system would no longer find itself in the precarious position of having the constant threat of underfunding or cutting, as well as academisation (a problem which is explained [here]). The vicious motive of personal profit desired by ruling class leads them to place –among other things— war, their own exemption from the relatively few taxes we’re able to get them to pay, and aid to foreign aggressive “Allies” above the education of our nation’s youth. This reality would, inevitably, if push came to shove, lead to them scrapping state education in its entirety so as to maintain their luxurious positions above the masses of the working class. Under a Marxist-Leninist system, there are no longer Capitalist rodents who have the option of subordinating knowledge to profit, putting the living standards of the people before all else. While there has been a slight downward trend from last year to this (2016-2017) in terms of youth unemployment, the phenomena still remains a very important issue plaguing our nation and our youth in every corner of society. According to the 2017 British unemployment statistics, 12.2% of all 16-24-year olds are currently unemployed (this includes the 10.6% of unemployed young persons not enrolled in some form of full-time education). We must now ask ourselves what the effect of such a situation is. One obvious effect is that the unemployed youth are left poor and, and with an employment market as competitive as it is nowadays, they are likely to remain in that state of borderline poverty for the foreseeable future. This state of unemployment will likely continue for these people far into their futures, further decreasing their chances at getting a job as they lack what a lot of employers would consider an appropriate level of experience. One effect of this is young people remaining in their parent’s houses long into their adulthood, a problem which is only further exacerbated by the continuously rising house prices, especially in and around London. It can also push them into taking courses at schools which do not, in the slightest, help them; something they do as a means of simply having something to do. However, all this does, in reality, is increase the often crippling levels of debt these young people are forced to “owe” the extortionate parasites who own the schools which they go to. And unfortunately, it can also lead young people down the path of crime – with no other means of surviving. So how are these issues solved by Marxism-Leninism? The answer to this is simple: unlike under the Capitalist system, which inherently necessitates the existence of a reserve army of unemployed labourers – both to drive down the wages of those with jobs, as well as to threaten such workers into not stepping out of line – Marxism-Leninism offers a system in which unemployment is, quite literally, a problem of the past. Removing the need to lower wages and employment, a socialist society grants to its citizens full, guaranteed employment, which, naturally, includes the youth. This aspect of Marxist-Leninist theory is so important to its implementation that you only need to look at the old constitutions of Eastern Europe, which had whole sections dedicated to spelling out, in no uncertain terms, that employment is the fundamental right of each and every citizen, explaining why, in these socialist states (at least while Marxism-Leninism was alive and well in their governments), there were absolutely no unemployment epidemics. What Capitalist country can boast 83 years of uninterrupted universal employment? Marxism-Leninism looks at the issues in education and employment we face today, and asks “Why?”. Why should a select group of children who have done as much to earn their way in the world as the next group get access to the nation’s best educational facilities and teaching staff? Why should so many young people have to face the prospect of unemployment when there are so many jobs to be done? Why should we just sit around and let our next generation down – forcing them into poverty, destitution and crime, whilst the families of the rich continue to live in luxury like the aristocrats they are? Marxism-Leninism tells us that Capitalism cannot change this state of affairs, and that we need socialism – a system of government run by the people, for the people – to provide us with education for all, employment for all, security for all, and so much else. Marxism-Leninism is undoubtedly the political movement that young people in Britain need today, and anyone who argues otherwise is limiting just how much we, as the future leaders of this world, can achieve. 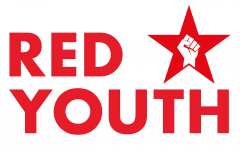 Red Youth is the only Marxist-Leninist youth organisation in Britain – join us today and begin making the changes to this country that you want, and we need, to see.